My Coconut Flour Muffin Recipe combined with Strawberry Chia Jam produces these wonderfully bright and flavorful Strawberry Chia Seed Muffins. 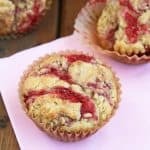 These healthy strawberry muffins make a great breakfast, snack or dessert and they are gluten free, paleo and clean eating. These Strawberry Chia Seed Muffins were developed as part of the recipe testing process for my eBook Coconut Flour Muffins, Pancakes & Mug Cakes. They didn’t make the book – not for lack of flavor or deliciousness, but because I changed course and ended up with more muffin recipes than could fit in the book. We weren’t able to spend the holiday season with our families, but we are now getting ready to enjoy a few freezing weeks in Canada – NOT!! On the freezing winter weather part. Although, I am excited to see Olivia’s reaction to her first (conscious) snow. Otherwise, this summer soul (with a birthday in December) is totally fine to spend the entire time indoors – hanging out with family and enjoying central heating. And taking care of the inevitable paperwork that always seems to wait for us, when we return to Canada. To prepare for this upcoming trip, I wanted to work ahead. While in Canada, I want to spend as little time as possible working and all the more time with our families – since we only get to see them 1-2 times a year. When looking at the calendar, I realized that Valentine’s Day was approaching awfully fast and I didn’t really have any fitting recipes prepared. 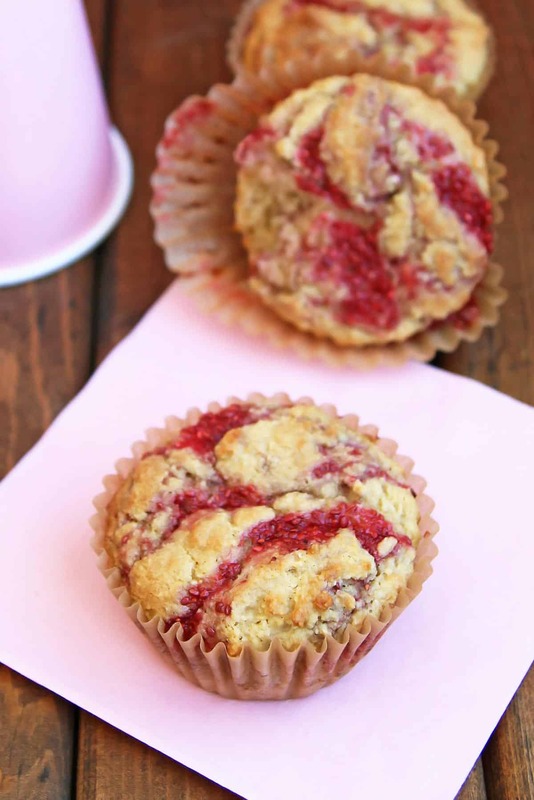 Until, I remembered these grain free muffins with strawberry chia jam. While these aren’t decadent Valentine’s chocolates or romantic dinner for two, the vibrant red strawberry swirl makes them quite fitting. 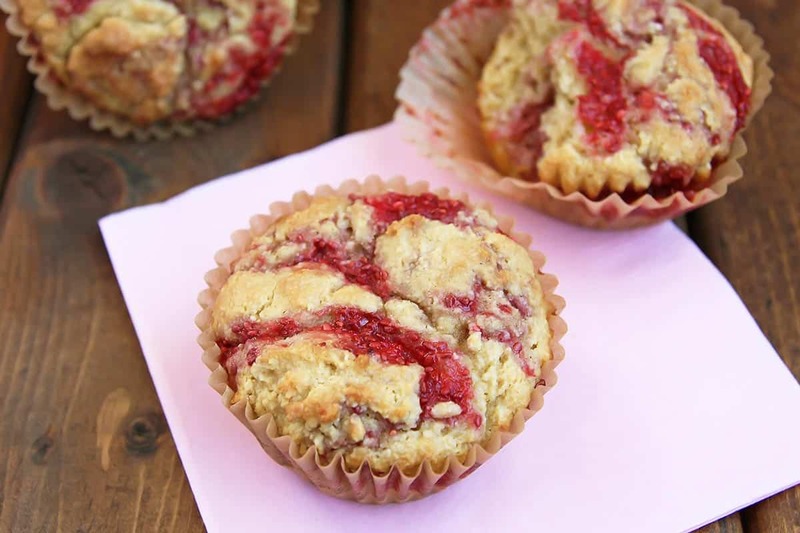 These gluten free strawberry muffins are perfect for Valentine’s breakfast, snack time at the office, and would even make a great healthier dessert. Now, let’s start with the jam. If you have ever wondered how to use chia seeds, chia seed jam is one great way. Chia seed’s thickening ability is perfect for making healthy vegan jam – no cooking required. I first made strawberry chia seed jam over 3 years ago. And it really couldn’t be much easier. You simply mash or blend any fruit to desired consistency (chunky or smooth – whichever you prefer), add a little lemon juice, sweeten with maple syrup and stir in chia seeds. Berries work best in my opinion, because the slight crunch of the chia seeds blends in with that of the berry seeds. It is similar to refrigerator strawberry jam, because it thickens over time, after you stir it up. Also, since this chia jam recipe isn’t cooked and only lightly sweetened, it should be stored in the fridge. 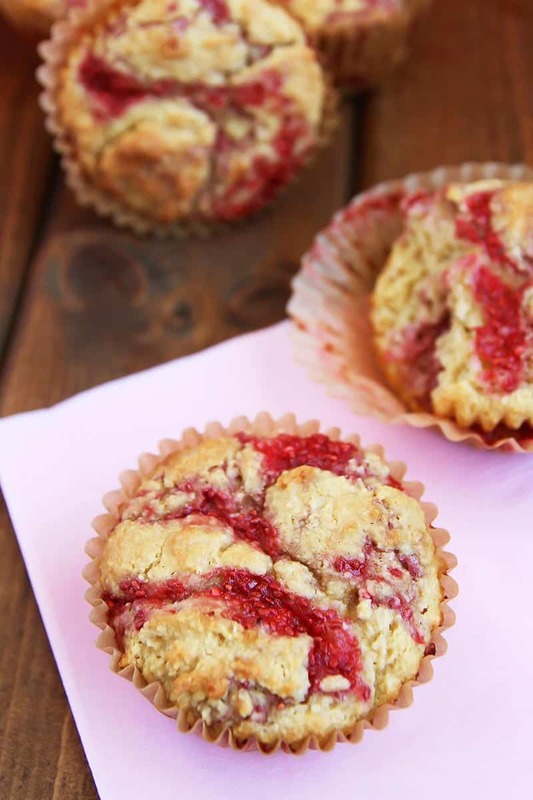 Finally, for this strawberry coconut flour muffin recipe, I cut my original chia jam recipe down to make just enough for a dozen strawberry jam muffins. Since coconut flour is already super absorbent, I didn’t put any chia seeds in this paleo strawberry muffins batter. Instead, the muffin batter and the chia strawberry jam are layered into the muffin cavities and then swirled together to create this nice pattern. I think, the chia seed strawberry jam is a great way to make strawberry muffins healthy and vibrant looking. Usually, just adding blended strawberries to the batter doesn’t yield a truly pink muffin or cake (unless food coloring is added). 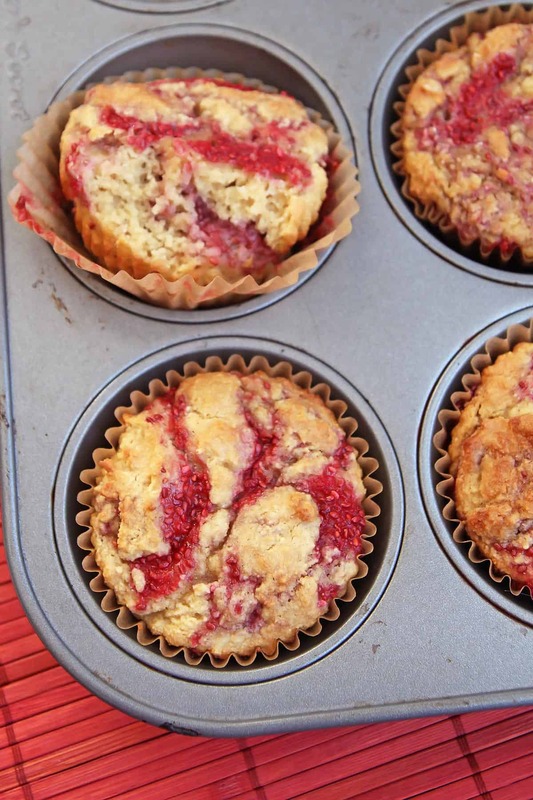 However, this way, you have a vibrant swirl of strawberry red and you can make these coconut flour strawberry muffins, whether strawberries are in season or not. Since the strawberry jam with chia seeds can be made with fresh or frozen and thawed strawberries. First, make the chia jam. Pulse berries in a food processor to consistency (smooth or slightly chunky). Then, stir in chia seeds, maple syrup and lemon juice. Set aside. 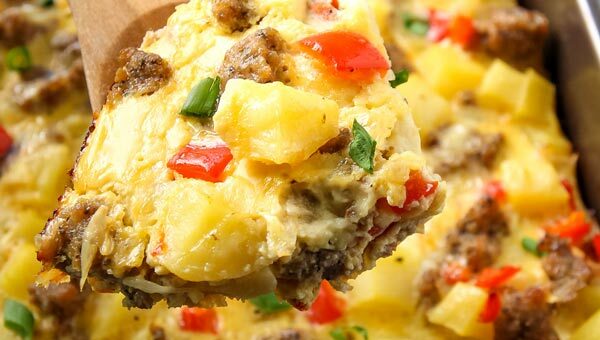 Preheat oven to 375° F and line a muffin tin with parchment or silicone liners. In a bowl, whisk together coconut flour, tapioca flour, baking soda, and salt. In a separate bowl beat eggs, oil, maple syrup and vanilla extract until combined. Add wet to dry mixture and stir until evenly incorporated. (Alternatively, you can also blend the ingredients in a food processor or blender.) 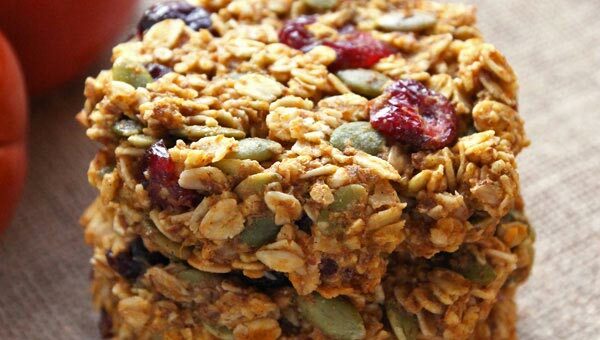 Only if the batter seems too dry, stir in 1-2 tablespoons dairy-free milk. Fill muffin cavities in this order: half batter, 2 tablespoons chia jam, other half batter, 1 more tablespoon chia jam; then swirl the layers with a toothpick or fork. Allow muffins to cool in pan for 10 minutes, then transfer to a wire rack to cool completely. Best served the same day! I am sorry these didn’t work out for you, Chantel. The issue may have been that you made them into 6 instead of 12. I do not recommend making them too big. Maybe they just didn’t bake through properly. Coconut flour simply needs eggs. My recipes already use fewer eggs than most coconut flour recipes. Is there any substitute I could use for eggs as my kids have allergies. 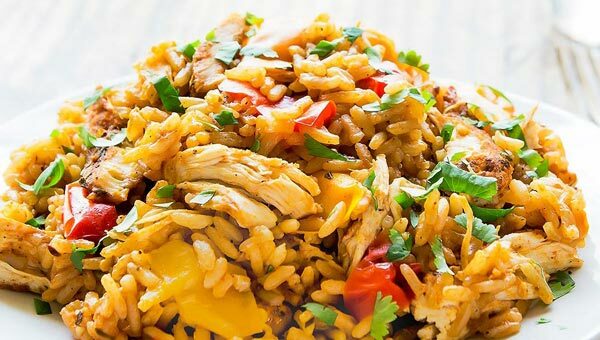 Looks so great would love to try! Can I just use more coconut flour instead of the tapioca flour? Or maybe substitute almond flour? Don’t use more coconut flour, I would just omit it then. Tapioca just helps to create a lighter texture but I’ve also made coconut flour muffins without tapioca. Maybe the almond flour works, but I have never tried it. Hi Karen, any other liquid sweetener like honey or agave syrup can be substituted. 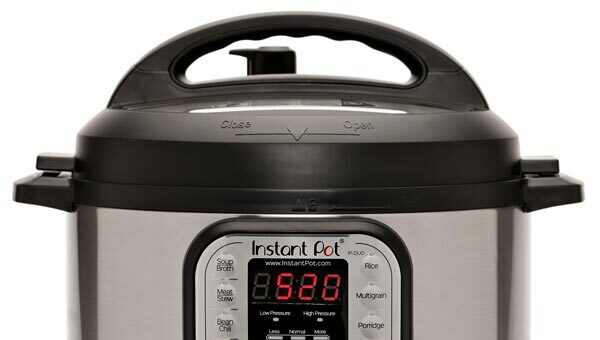 So I tried this tonight, for me it only made 7 muffins. I found that odd. The chia seeds seemed to outweigh the strawberry. In your pictures it looks more red, my jam was dark because of the amount of chia seeds. But my measurements were correct…. They tasted good, but I think next time I would just add a bit more strawberry and reduce chia a bit.